Are you getting ready to prepare for your Therapeutic Procedures Final Exams? If so then this post is for you. We created this study guide to help you ace your exam and the practice questions listed here can help you do just that. As a Respiratory Therapy student, it’s required of you to know and understand all the different therapeutic procedures that you will carry out on a daily (or weekly) basis in your career as a Respiratory Therapist. That is why this information is so important. So let’s go ahead and dive right in! 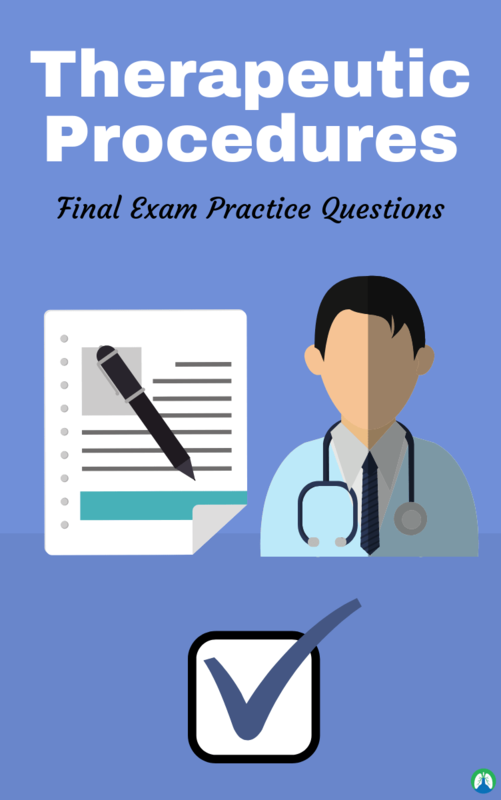 Below you can find all of the practice questions that can help you prepare for your Therapeutic Procedures Final Exam. If you want the correct answers to all of these questions, you can get them (for free) by Clicking Here. 1. When using water traps to help minimize the problems caused by condensation in a heated humidifier ventilator circuit, where should the RCP place the traps? 2. Which of the following describes the correct position of a properly inserted oropharyngeal airway? 3. Which of the following devices can deliver an FiO2 higher than expected if the patient’s tidal volume decreases? 4. Which of the following devices is appropriate to use for temporarily administering ventilation during CPR when a manual resuscitator is not available? 5. Which of the following features incorporated into most endotracheal tubes assist the RCP in verifying proper tube placement? 6. Which of the following humidifiers would be appropriate to use with adult mechanical ventilators? 7. Which of the following is NOT a consideration when administering ventilation to an infant with a manual resuscitator? 8. Which of the following should the RCP suggest to help minimize the problems caused by condensation in heated humidifier circuits? 9. Which of the following statements is false about low-flow O2 delivery systems? A. The greater the patient’s inspiratory flow, the greater the FiO2. B. The patient’s flow usually exceeds that from a low-flow device. C. The O2 provided by a low-flow device is diluted with air. D. All low-flow device provides variable O2 concentrations. 10. Which of the following types of humidifiers should the RCP select to reduce the accumulation of water in the circuit of a mechanical ventilator? 11. Which of the following would be an absolute contraindication to CPAP therapy? 12. While an oropharyngeal airway is being inserted into an apparently unconscious patient, the patient suddenly begins to cough violently. What should the RCP do to ensure a patent airway for this patient? 13. While analyzing the FiO2 in different areas of a mist tent providing aerosol therapy to a 15-month-old, the RCP notices that the analyzer is fluctuating from 25% to 35%. What action should the RCP take at this time? 14. While checking the operation of a mist tent being used by a two-year-old child, the CRT notices the absence of mist entering the enclosure. What corrective actions should be taken in this situation? 15. While performing rounds, a RCP is told by a patient wearing a cannula at 4 L/min O2, “It feels like nothing is coming out.” Which of the following should be examined by the RCP? 17. While using a manual resuscitator during a resuscitation effort, the patient remains cyanotic. What steps should the RCP take to ensure that the highest possible oxygen concentration is being administered? 18. You note that the air intake port of a venturi mask set to deliver 35% is partially obstructed by the patient’s bedding. Which of the following would you expect to occur? 19. Which of the following accessory devices would be appropriate to use with MDI for administration of metaproterenol to a patient who has hand-breath coordination difficulty? 20. When using an MDI without a holding chamber, the patient should be instructed to fire the device at what point? 21. To ensure delivery of the proper drug dosage with an MDI, which of the following must be done before it is used? 22. A patient’s prescription for an MDI bronchodilator specifies “2 puffs QID”. What time period should elapse between each puff of a single treatment? 23. For which of the following patients would you recommend against using a flow-triggered MDI for a bronchodilator delivery system? 24. Proper use of a DPI requires that the patient be able to do which of the following? 25. Which of the following patient groups would use of a DPI for bronchodilator administration NOT be recommended? 28. An 18-month-old cystic fibrosis patient is hospitalized for secretion problems. Which of the following devices would be best suited for this patient? 29. An adult patient has a Shiley cuffed tracheostomy tube inserted and is receiving aerosol therapy form a T-piece. The patient complains of difficulty breathing and the RCP is unable to pass a 14-French suction catheter into the patient’s trachea. Which of the following actions is most appropriate at this time? 30. An alert patient who has a pH of 7.36, PaCO2 of 42 mmHg, and a PaO2 of 40 mmHg while receiving a FiO2 of .60 is considered to be in acute oxygenation failure. The patient will require oxygenation for the next 24 to 72 hours. Which of the following devices would be most appropriate for administering oxygen to his patient? 31. An infant requires both a precise high O2 and needs to maintain a neutral thermal environment to prevent cold stress. Which of the following systems would best achieve this? 32. An intubated patient with a minute ventilation of 12 L/min is connected to a T-piece and air entrainment nebulizer set at 70% O2 with the O2 flowmeter set at 12 L/min. Which of the following is true? 34. During administration of a noninvasive CPAP via mask to a patient with atelectasis, you find it difficult to maintain the prescribed airway pressure. Which of the following are most likely the problems? 35. How often should HMEs be replaced? 36. How would you estimate the appropriate length for a nasopharyngeal airway? 37. Immediately after an oral intubation attempt on a cardiac arrest victim, you hear bilateral breath sounds during ventilation but observe only a slight color change on a disposable CO2 colorimeter attached to the airway. Which of the following actions would be most appropriate to take? 38. It is suggested that bubble humidifiers are of limited effectiveness at flows above which of the following? 39. The RCP is checking the aerosol output from an air entrainment nebulizer and notices that the aerosol output has decreased. Which of the following situations would cause a decreased aerosol from the nebulizer? 40. The RCP is working with a patient who is receiving 35% O2 from a Venturi mask and notices that the patient has thick secretions. Which of the following are possible actions to take that would help this situation? 41. The removable inner cannula commonly found in tracheostomy tubes serves which of the following purposes? 42. What should be done with the outer cannula of a tracheostomy tube when the inner cannula is being cleaned? 43. What size ET tube would you select to intubate a 1500 gram newborn infant? 44. What would be the most appropriate humidification system for a patient with an artificial airway in place? 45. When checking an oxygen delivery system that incorporates a bubble humidifier running at 6 L/min, you occlude the delivery tubing and the humidifier pressure relief immediately pops off. What does this indicate? So there you have it. I hope that this study guide can serve as a great review for your Therapeutic Procedures Final Exam. I realize that each Respiratory Therapy program is different, so I may not have included a question about every single topic that you’ll see on your final exam. Still, if you go through this information, I have no doubt that you can boost your knowledge and improve your score at the same time. And that’s what it’s all about! I wish you the best of luck and as always, breathe easy my friend.